I was super excited when Sarah reached out to me a couple of months back regarding this collaboration (Obv. I was hyped about getting my nails done), but it was when we met I instantly had a level of respect for her. She knows what she wants and is currently working hard & smart to get it. Starting from a blog to owning her own nail academy, that’s a huge step especially in a country like Nigeria. Meet Abimbola Odunmbaku popularly know as SARAH JAMES; the nail artist changing Nigerians perception of nails as a career. S: Hi, Abimbola Odunmbaku popularly know as SARAH JAMES; a nail & lifestyle blogger and a professional nail artist. Founder of EmbellishbySarahJames ; a nail business striving and breaking the norm. It’s been 11 years now it literally just came to me, I know how cliche that might sound. But it all started during my Cambridge year whilst doing jamb lessons I would buy a lot of nail products while I pass through the market, I was particularly fascinated with French tips at that time, my nails used to hurt cause I would always file my nails & change it every 2 days with no proper knowledge then about nails. Finally I was in Uni, during our matriculation back in school I asked all my friends to buy “colored tips” and I fixed everyone’s nails. I’d beg all my friends to let me fix their nails cause no one believed I could y’know. Fixed nails for free till I was in my second year (200 level) I officially started it as a business with the pricing 500 NGN which later went up to 1,500 NGN. A lot of people would stay a day after school was over just to fix their nails. I did a lot of nail art. But after school I thought about what I’d do outside the constrained walls of a school where all the girls had no choice but to come to me. *Laughing hysterically Sarah says during her time in uni I was reported to the dean (a story for another time) at the end of it all God came through for me. WHAT’S THE DIFFERENCE BETWEEN YOUR NAIL PRICING THEN & NOW? ONE MAJOR CHALLENGE YOU FACE AS A NAIL ARTIST? Taking a deep breath Sarah says; Convincing people of the worth of my service, not just because of my masters degree but I have spent thousands of pounds going to beauty schools in the UK. In the US/UK or anywhere outside the country you can’t do nails without a license and an insurance. Let’s say you fix nails for a particular person & she reacts to the glue, if you have no license you can be sued and your business shut down. WHAT DETERMINED THE CURRENT PRICING? Take blogging for example: if you spend 20k you out an outfit together and 10k to pay a photographer or even something as little as buying a vscopresent for 600 NGN one way or another I need to make my money back. TELL US ABOUT NAIL TREATMENT ? But if I spot a nail disease, infection or disorder I have no right to threat that, all I’m obligated to do is refer you to see a doctor but if its something a nail treatment can do like making your nails stronger I’d give you physical treatment and that’s basic nail care. 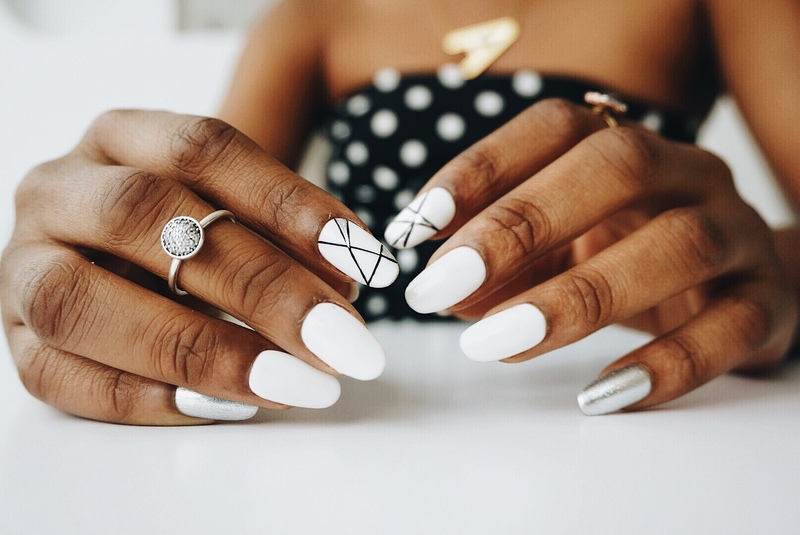 WHAT’S YOUR TAKE ON MATCHING YOUR NAILS TO YOUR OUTFIT? S: My clients pay me and have a right to their preferences but I’d always advice a bride to go for something neutral because after your wedding you would go back to work but if you want a yellow nail to match your owambe then I’d do it. FUTURE PLANS for EMBELLISHED BY SARAH JAMES? S: Currently working on launching The “Embellished Academy” properly but for now we have one student graduate and this was my drive to get a certificate when I was in the UK because if I want to issue out certificates over here in Nigeria I need to be Certified Myself. With a BSc. in Industrial Relations & Human Resource management and Masters in Strategic Marketing; Sarah James as fully gone into the business of Nail Artistry with the mission to impart this knowledge into others. N: That’s simple and quite classy, I Love! TELL US WHERE YOU SHOP? WHAT IS THAT ONE QUOTE YOU LIVE BY? S: Whatever God will not do, He will not show you or lay it on your mind.